This book has a modest goal. It is not meant to be the be all end all, all-encompassing tax code review. My intention is to provide super-practical advice to self-employed artists – and anyone else who is self-employed. It’s about demystifying the process of preparing your taxes, to dial down the intimidation and fear of interacting with the government, about empowering you to make wise tax planning decisions, to let you know what you have to do tomorrow, next week, next month, and next year. I have run my own tax preparation business for 30 plus years. I have prepared tax returns for artists and other self-employed individuals tens of thousands of times. I understand what it means to be self-employed. You are risk takers, free thinkers, seeking alternative ways to live your life (suit and tie optional). You created your own business vision because your passion led you there. Along with your creative success comes the burden of handling your business, and that means taxes. I have seen clients leave their confidence, their common sense, and their logic at the doorway into the world of taxes. Those traits are replaced with panic, procrastination, sleepless nights – all as a result of feeling that taxes are beyond your control, that you don’t understand them and never will be able to. Bottom line, taxes cannot be ignored. We all have to prepare and file tax returns and pay taxes every single year. The choice is clear – continue down the path of self-torture, or change your perspective. So let me welcome you now into the world of calm, cool, and confident! That is how you will feel after you digest the information contained within these pages. • Andrew Stern, aka Ztaxman, has been making brilliant cut-to-the-chase sense out of the fog of nonsense that is the tax code for me and other lucky citizens for decades now. The wonder of his book is that he spares the spin, spares the brag, spares the angst, and simply unlocks and opens the palace of wisdom in as direct a manner as possible. If he were a filmmaker, he’d be Ozu. If he were a songwriter, Willie Nelson. • Every year, the dreaded day comes. April 15th! Taxes are due. Panic sets in! Not anymore! 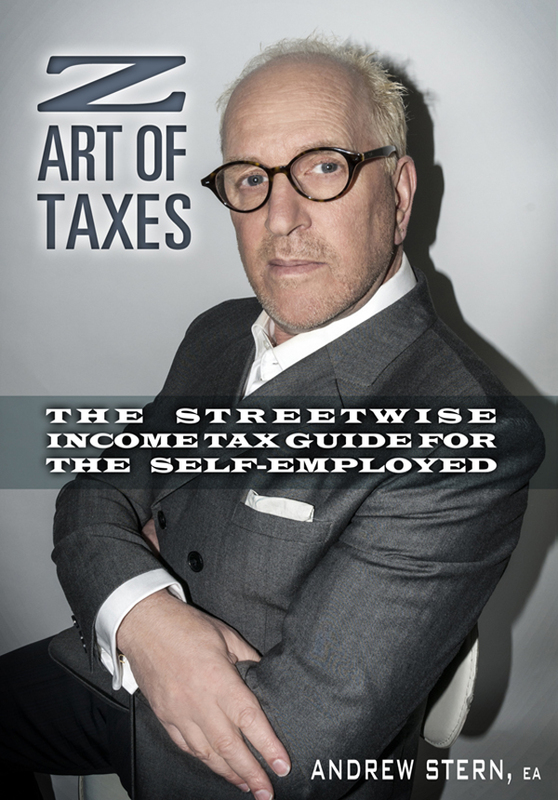 After reading “Z Art of Taxes, The Streetwise Guide for the Self-Employed Artist, and Every Other Self-Employed Taxpayer” by Andrew Stern. All my worries are gone. The book explains everything I need to know about keeping track of my expenses. I highly recommend this book to all my friends. You can purchase the book online from Smashwords in multiple eBook formats at http://www.smashwords.com/books/view/281305.Cover design and eBook formatting by Shelley Glasow Schadowsky.